This iconic evergreen tree is native to California the California coast, coastal plains, Valleys and foothills. These trees typically grow to 25'-40' high but old specimens can grow to 100 ft. The wide spreading limbs form a shady, helmet-like canopy, growing to 35" feet or more across, with the oldest specimens being recorded as over 100' wide. The small, leathery, tough leaves have spiny margins and are convex. It is thought that the convex shape allows dew and mist to hold onto the leaves to provide moisture, allowing the tree to survive with very little rainfall. The acorns were a staple of indigenous tribes, while early settlers used the wood for charcoal. 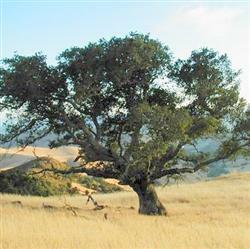 Coast Live Oak will tolerate salt spray better than most other native oaks and are well adapted to the foggy, warmer climate of the coastal regions.